Tampa, St. Petersburg, Clearwater, Florida. Being told that you have arthritis in your knee(s) and that joint replacement is inevitable can be frustrating in its own right. Being told that your knee isn’t bad enough for surgery yet, but there’s really nothing you can do to prevent it, can be maddening. Thanks to advancements in modern medicine, innovative regeneration techniques can provide you with options to help repair your knee before it becomes damaged enough to require replacement. At your Florida Spine & Sports Medicine Center in Clearwater and New Port Richey, Dennis M. Lox, MD, emphasizes non-surgical treatments to increase your quality of life by reducing knee pain. What is Regenerative Knee Joint Therapy? Regenerative medicine focuses on the degenerative processes that deteriorate your joint at the cellular level. Treatments can now target negative cellular functions, or enhance positive ones, through methods involving genes, DNA, and the transcription of specific proteins. In the field of joint medicine, regeneration techniques have revolutionized the approach to repairing knee injuries. The first step to repairing a damaged joint is to reduce the pain, stiffness, and swelling to help prevent the loss of function. Combining conservative therapy, such as pain medications, anti-inflammatories, and cortisone injections, with regenerative and reparative techniques can effectively treat conditions that were previously believed untreatable. 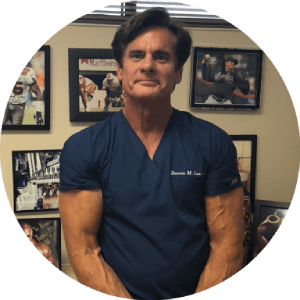 As a specialist in regenerative medicine, Dr. Lox offers a variety of alternatives to knee surgery to help you avoid a situation where your only option is waiting for your knee joint to deteriorate sufficiently to justify a replacement procedure.